July, August: no stamp shows, no auctions, my clients on holiday. This is when I tidy the office - and the stockbooks. 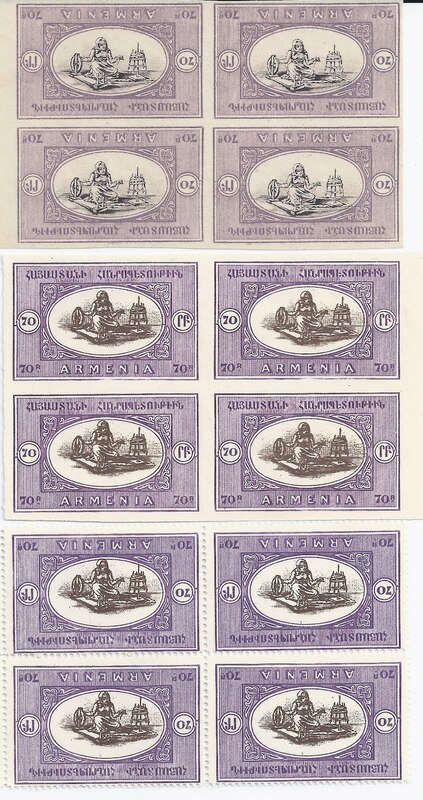 Today it is the turn of the unissued Dashnak Armenia pictorials of 1920 - the "Chassepot" stamps, named after the Paris printing works where they were printed. And reprinted. 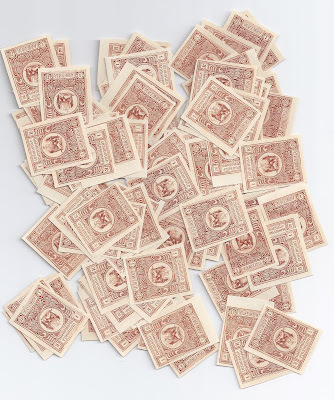 The Reprints are very common and varieties which are rare for the Originals, like imperforates and inverted centres, are common for the Reprints. Fortunately, it's very easy to tell the difference. Shades, gum, paper, printing quality differ. Most importantly, the plates were reset for the Reprints (and probably a different printing method used). 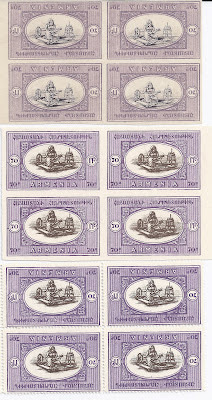 On the Reprints, the stamps are spaced wider apart. Unfortunately, very few collectors want to know this and continue to buy Reprint varieties at prices which should only be paid for Originals. Above at the bottom, the brown stamps are my stock of 1 rouble imperforates from the Reprints. The wide margins are a give away. And the price ought to be a give a way too, at most a dollar. And that is tops. But the 1 rouble imperforate from the Original printing will cost a minimum of $150 if I can find one for you. Above at the top in lilac and black a very rare block of 70 r imperforates from the Original printing with the centre inverted. Think four figures in dollars, euros or pounds. (I bought it from the Cunliffe collection of Inverted Centers of the World). Underneath, 70 rouble imperforate and centre inverted blocks of 4 but Reprints so maybe $5 for the imperforate block and maybe $20 for the inverted centre block - the inverted centres are quite popular, even as reprints. But if you were buying the Original block, you would get these free for sure.